We All Have A Right To Clean Water. We drink it, we cook our food in it, we bathe in it, we use it for our gardens, crops and animals. Every living thing depends upon water. We cannot live without. That’s why the news, delivered in a letter from the U.S. Navy in early November, 2016 to Island County residents that OUR water might be contaminated with chemicals from firefighting foam – was so shocking. As the news rippled through Whidbey Island that our single source aquifer was, in fact, contaminated we became aware that the magnitude of this contamination was huge and that contaminated drinking water is impacting citizens, both military and civilian, across the nation. Today, PFOA alone has been detected in 94 public water systems and in 27 states. In 1981, the harmful impacts of PFC’s came to the surface based on the work of private citizens who took heir case to court over the health impacts from working in corporations manufacturing products with these man-made chemicals, most notable the Dupont Company and it’s production of Teflon. Many great articles have been written about this landmark case and decision. A $16 million dollar suit ultimately ended Dupont’s Teflon production. What are these chemicals and why should we be concerned? PFASs are a group of per- and poly-fluorinated alkyl substances. PFASs are very stable man-made chemicals that remain in the environment without breaking down and some of them build up in people and the environment (bioaccumulation). PFOS and PFOA stand for perfluorooctane sulfonate and perfluorooctanoic acid, respectively. Both are fluorinated organic chemicals, part of a larger family of compounds referred to as perfluoroalkyl substances (PFASs). These substances are synthetic compounds that are unique for being water and lipid-resistant. Because they deter water, grease and oil, fluorochemicals have proven useful for a variety of manufacturing processes and industrial applications. Unfortunately, during the manufacturing processes used to create these household products, substantial quantities of PFOS and PFOA were dumped into the soil, emitted into the air and poured into the water surrounding factory sites. The products created at these facilities have also been distributed to homes throughout the United States and around the globe. Direct contamination from manufacturing and consumer use of these products is estimated to exceed 7000 metric tons of the fluorochemicals. As a result most people have been exposed to PFOS and PFOA, and the two compounds have become a serious concern for wildlife, the environment and human health. Why are these chemicals a problem? A startling 2007 study conducted with data from the U.S. National Health and Nutrition Examination Survey (NHANES) in collaboration with the Centers for Disease Control (CDC), sought to assess fluorochemical toxicity across the population. Researchers detected the presence of PFOS and PFOA in more than 98% of the blood samples tested. PFOS and PFOA were also recently added to the Unregulated Contaminant Monitoring Rule Program, a list of 30 chemicals that are known to, or anticipated to, occur in public water systems. Public water system sites around the country have been monitoring their presence and documenting results to assess the frequency of contamination. Preliminary results have shown that 52 public water systems in 19 states plus two Pacific Island territories have reported levels above the maximum contamination level. Studies in humans suggest an association between increases in blood cholesterol and higher PFOA or PFOS blood levels. High blood levels of PFOA and PFOS may also be associated with increased uric acid levels and liver damage. More concerning however is literature suggesting that concentrations of PFOS and PFOA below the established threshold of 70 parts per trillion could also have immunotoxic and carcinogenic potential. Evidence suggests that continued low-level exposure in drinking water may also result in elevated body burdens and adverse health outcomes. One group of researchers out of Harvard University and the University of Massachusetts published a report stating that the EPA’s drinking water limits are based on outdated research and that their estimate of what is safe may be more than 100-fold too high. This would mean that many more communities are at risk. In May 2016, the Environmental Protection Agency released a lifetime health advisory level that recommended limiting PFOA and PFOS to 70 parts per trillion (ppt) in drinking water to avoid health effects over a lifetime. The EPA strongly stands behind its advisory, stating that the 70-ppt limit was created after years of analysis of the latest research on the chemicals. EPA officials have said the 70-ppt limit is protective of the health of all humans, including the most vulnerable — nursing or expectant mothers, infants, and fetuses. Some have raised concerns that the 70-ppt limit isn’t protective enough. Vermont has set an interim state standard of 25 ppt for the chemicals, less than a third of the EPA’s 70-ppt limit. In September 2016, the New Jersey DEP’s Drinking Water Quality Institute released a 14 ppt recommended limit for the chemicals. This news organization investigated the differences between the NJDEP and EPA and found valid concerns about the EPA’s 70 ppt limit. The C8 Science Panel, which produced the largest body of research to date, found health effects after analyzing a population that was exposed to as little as 50 ppt of PFOA. In June 2015, researchers Philippe Grandjean, of the Harvard School of Public Health, and Richard Clapp, of the University of Massachusetts-Lowell, released an analysis stating they believe a safe level of PFOA in drinking water to be approximately 1 ppt for some health effects. Currently, the Washington State Department of Ecology and the State Department of Health are working on a Chemical Action Plan (CAP) for Per- and Poly-Fluorinated Alkyl Substances (PFAS). A CAP is a comprehensive plan to identify, characterize and evaluate all uses and releases of a specific PBT, a group of PBTs or metals of concern. A CAP is a plan, not legislation or a rule. It recommends actions to protect human health and the environment. Some of the recommendations may lead to new legislation or rules. These would go through the normal legislative or rule-making process. Renewed pressure is now being focused at the national level on the U.S. Agency for Toxic Substances and Disease Registry, the arm of the U.S. Centers for Disease Control and Prevention typically tasked with performing such studies. ATSDR said in a meeting convened by U.S. Sen. Bob Casey, D-Pa., last year that it supports conducting a nationwide health study, but lacks approximately $30 million in needed funding. The military has been asked to fund the study, as the local contamination originated in firefighting foams used at military bases around the country and at Naval Air Station, Whidbey Island. The Department of Defense has so far declined to do so. Lawmakers are attempting to use the annual military appropriations process to require the military to fund the study and have authorized a five-year study in the Senate’s National Defense Authorization Act, funded at $7 million for the first year. Similar language was also included in the House’s version of the bill. Since these are unregulated chemicals, the military is reluctant to pay the costs of cleanup, find new water sources or to take responsibility for the harm they’ve directly caused to civilians and service members. This means that citizens must educate themselves, work together and put pressure on the military to remedy impacts and contamination. Communities that work together are the ones getting results. The problem is national in scope: the military is investigating over 400 sites for water contamination. The contamination has reached drinking water supplies in states as diverse as New Jersey, New Hampshire, Colorado and Washington. Records obtained recently by Philadelphia law firm Williams Cuker Berezofsky, which is suing the federal government over groundwater contamination near a trio of former and current military bases in Bucks and Montgomery counties in Pennsylvania, shows that the U.S. military knew by 2001 that firefighting foams used across the country could break down into toxic chemicals, and that they could be potentially be polluting drinking water wells. Mark Cuker, the firm’s lead attorney on the case, provided Kyle Bagenstose of the Bucks County Courier Times with a look at the 170 documents, totaling more than 3,100 pages and spanning the 1970s to 2017. The following information contains some highlights and quotations from his two-part article. 3M was the military’s primary provider of “aqueous film-forming foam,” which was used across all military branches. Other foam suppliers used a different process than 3M, called telomerization: Their foams didn’t contain PFOS but eventually were found to break down into PFOA, a similarly concerning chemical. Both PFOS and PFOA have been linked by some studies to a range of illnesses, including reproductive and developmental issues, gastrointestinal diseases, and some cancers. Records show Curtis Bowling, then-assistant deputy undersecretary of defense for force protection, led the DOD’s reaction to 3M’s announcement. “Meeting minutes from that March 2001 workshop weren’t included in materials turned over by the military, but military records turned over to the law firm do contain memos sent before and after the March 16 workshop. One email chain, circulated around the Navy’s aircraft carrier program, had personnel discussing potential impacts to outfitting ships like the USS Carl Vinson and USS Ronald Reagan. Although not mentioned by Bowling, the military was privy to other prior warnings on firefighting foams. In 1999, Oregon State University researchers published a study disclosing, for the first time, that perfluorinated compounds such as PFOS and PFOA existed in groundwater below three military bases they examined: the Naval Air Station Fallon in Nevada; Tyndall Air Force Base in Florida; and Wurtsmith Air Force Base in Michigan. Former researcher Dierdorf said the 1999 study, conducted by doctoral candidate Cheryl Moody and adviser Jennifer Field, was a breakthrough in identifying the chemicals. In August 2000, the Navy Technology Center for Safety and Survivability hosted a “DOD AFFF Environmental Meeting” in Washington, D.C. Several presentations were delivered by the environmental engineering firm Jensen Hughes, and records indicate the company was a consultant to the DOD on firefighting foam and other fire protection issues. In early 2001, the Department of Defense was scrambling to plan for a potential crisis. – a lack of fire-fighting foam. Chemical company 3M had announced it would stop making special firefighting foams, which the military used to ensure fire protection at bases across the country and on its Navy fleet. 3M was concerned about the environmental and health risks presented by a chemical ingredient, PFOS. The Environmental Protection Agency also had recently raised serious concerns about this chemical. Military personnel realized that even if the EPA found telomer foams did break down into toxic byproducts, it was powerless to stop their use under the main toxic materials law, the Toxic Substances Control Act. In 2006, the EPA had forged a voluntary agreement among chemical companies to stop making PFOA by 2015. These companies agreed to voluntarily reduce factory emissions and product content of PFOA and related compounds* on a global basis by 95% no later than 2010. They agreed to work toward total elimination of emissions and product content of these compounds by 2015. This agreement meant the foam companies also had to change their foam formulations to remove the chemical. But records show that while the foam industry worked on improving its chemistry, the military continued to use “legacy” foams known to be hazardous. These stockpiled foams are still on Navy fire trucks at NASWI and at OLF Coupeville in 2017. The document used a “risk-based” approach to deliver policy recommendations for how the Navy could “prevent an environmental impact” because of foam being released from buildings such as airplane hangars. Ultimately, the report concluded the most troubling scenarios were large discharges of foam to waste water treatment plants, as the foam could potentially violate environmental protection laws. In a 2011 report to the Fire Fighting Foam Coalition on the estimated inventory of PFOS-based foams it was revealed that between 2004 and 2011, the military used an estimated 1.053 million gallons out of an original supply of 2.1 million gallons of the PFOS-based foams. The author concluded that he was “unable to find any evidence” of foam disposal via incineration. He noted this meant the military had used about half of its 2-million gallon supply of PFOS foam in the seven years, well after the foam’s environmental and health hazards were established. The report concluded that “The consumed AFFF ends up highly diluted in surface waterways, in subsurface water, absorbed into the ground, or partially evaporated”. Anecdotal records from military bases show releases to the environment also continued to occur until the present. Notably, no reports appear to have been made assessing the potential dangers posed to on-base personnel or nearby communities who got their drinking water from aquifers resting beneath the bases. The Department of Defense still says it’s unable to fund a retrospective health study to determine if there are unusual amounts of illnesses linked to the chemicals, although a growing contingent of federal lawmakers is working on legislation to force it to do so. The Navy Is on Record for Knowing the Harm Caused by Fire Fighting Foam but Ignoring it. They Need To Clean It Up. 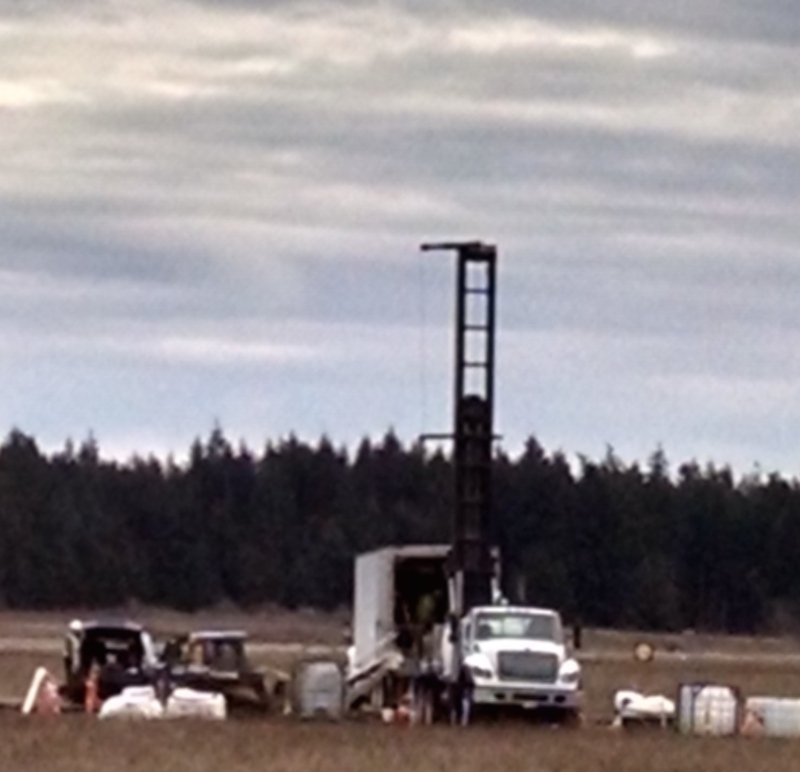 On Whidbey Island, the proof that the Navy had contaminated Island County’s single source aquifer arrived with the first lab tests in early 2017 – when the Navy was forced to do testing by the EPA. In May of 2016 the EPA issued a health advisory for PFOS and PFOA in public water systems, warning municipalities that the presence of levels over 70 parts per trillion in community water supplies is not safe. This can be equated to just one drop of the chemicals in 20 Olympic sized swimming pools. The Navy partnered with Island County Board of Health and drew up a testing and information plan, which both entities refused to share with the public until testing was well underway. For some reason, it was decided to test for only 3 of the 6 known contaminants in the public and private home-owner wells. What was the result of the testing? 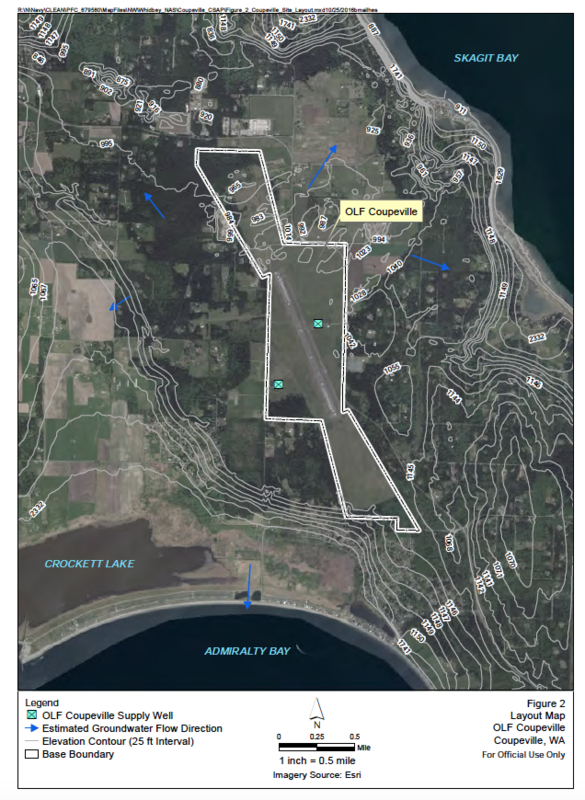 The town of Coupeville’s unprotected and contaminated well, which sits next to the OLF, is providing PFAS-water to schools, businesses, Whidbey General Hospital, and hundreds of families. Since late 2016, some families with contaminated wells near the OLF have had to abandon them and drink, cook, and brush their teeth with water in plastic bottles. When the Town of Coupeville twice tested its wells in November of 2016, the well next to the OLF had 55.8 ppt. and 62.2 ppt of PFOA. After water from this well was “blended” with other non-contaminated well water at the distribution point, it still contained 25 and 27 ppt of PFOA. When the Navy tested Coupeville’s wells in December of 2016, the well next to the OLF had 55 ppt of PFOA. After water from this well was “blended” with other well water and tested at the distribution point, it still contained 38 ppt of PFOA. Testing of private wells by the Navy, within a one mile from the OLF’s first known contamination site, found PFOA many times higher than EPA’s Advisory Level (70ppt) – one as high as 600 ppt. On March 4, 2017 the Navy tested 27 monitoring wells it had installed at the OLF. More sites and higher levels of contamination in the aquifer were discovered in some of those wells. PFOA was found up to 1,190 ppt, PFOS up to 54.7, and PFBS up to 473 ppt. PFAS’s have been in found in wells to east, west, and southwest of OLF’s runway. Yet, the Navy has only expanded its search area to the south, where the highest contamination results were found. Ongoing monitoring of wells is a practice other parts of the country have learned is of critical importance, as ground water moves continually and contamination can occur where it was previously not detected. The blue arrows in the image below provided by the Navy indicates the flow of groundwater. When contamination is found by the Navy above EPA’s health advisory level, people get water delivered in plastic bottles. Home owners get notification of contamination that they will have to disclose, and that may lower their property values. If owners want to sell to escape the problem, the pressure is to do it BEFORE water contamination is proven, because afterward, they are stuck with a property that likely will never sell. No remedies have so far been proposed by the County, the town of Coupeville or the Navy. Finding out the truth brings restrictions and no help, so it can seem like it’s just better not to know. Immediately install appropriate filtration systems on private and public wells that are contaminated or at risk. This includes Coupeville’s wells or its treatment plant. The Navy should provide clean alternative water to those entities whose water it has contaminated. This could mean locating and installing new supply wells, or piping water from clean water sources. Too many people have been living off bottled water for far too long with no end in sight. Retest and monitor all public and private wells known to be contaminated, including wells at risk. Wells with any level of contamination, and those at risk, should also be monitored. This is necessary to track a moving contamination plume and to know how much of what is in it. People can then take protective actions before they are exposed. Add PFHxS, PFHpA, and PFNA to the list of chemicals being monitored at the OLF’s on-site monitoring wells. And, make the full reports of analysis public. Test and monitor private and public drinking water wells for all six PFAS (at least) found at the OLF and at the lowest possible detection levels. Testing for PFAS’s at the lowest detection limits will help to identify the presence of PFAS’s and the extent of the contamination plume. Detection limits being used in the Navy’s testing do not reveal the lowest concentrations that can reliably detected. (This is why PFBS was found in the Coupeville citizen’s water sample, but not in samples taken by the Town of Coupeville’s or the Navy. Map the location of all sites where PFAS’s of any concentration have been found. This can be done without identifying a specific piece property. The Navy is doing this now, but not for all PFASs and only for wells at or above EPA’s advisory limit. Mapping for all PFAS’s found at the lowest reliable detectable levels would likely reveal a much larger and realistic footprint of contamination. Knowing how far and in what direction the plume has spread has not been the objective of the Navy or Island County, even though knowledge of the plume’s location and direction would give citizens at risk a chance to take protective measures. Stop the migration of contamination and get the PFASs out of the aquifer. echnologies exist for doing so. One technology, known as pump and treat, draws water from the aquifer for activated carbon or other treatment. This can change the direction of groundwater flow. It would act much like the Town of Coupeville’s well, which is likely to be attracting contaminated drawing from the aquifer beneath the OLF.